In a large bowl mix together the vegetable oil, garlic, salt and pepper. Toss the eggplant in the marinade. Heat the grill, and when hot, brush the grill with oil. Place the eggplant directly on the grill, grilling both sides for 3-5 minutes each. Season with additional salt and pepper if desired. 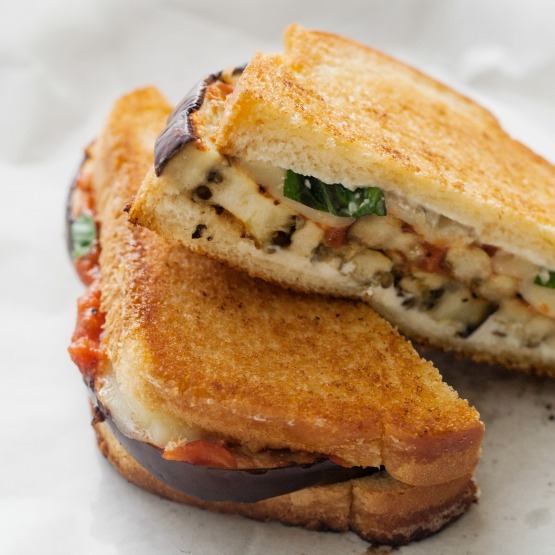 Brush the outer sides of bread with oil and then assemble the sandwiches with the grilled eggplant, cheese and any desired additional condiments. Place the sandwiches on the grill, weighed down with a skillet or grill weights. Grill each side.